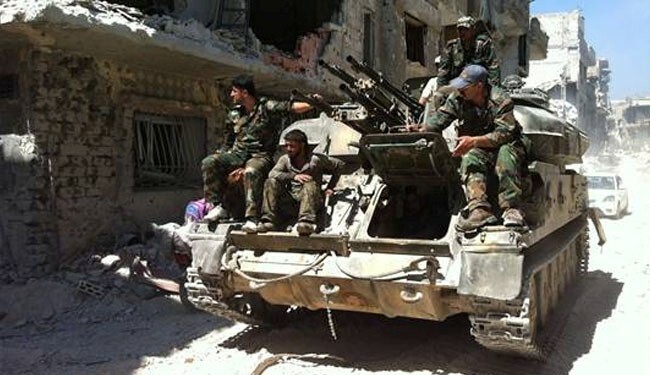 JNN 22 Apr 2015 Damascus : The Syrian army and Volunteer forces freed two strategic towns in the Northern province of Aleppo after fierce clashes with terrorists. The two strategic towns of al-Rashadiya and Hajarat al-Kabirah were freed after the terrorists’ hideouts were also destroyed in military operations in the countryside of Aleppo. After pushing back the terrorists in al-Rashadiya town, security was established on the international highway to prevent the terrorist groups’ attacks on rescue and relief convoys. The freedom of the two towns also led to the withdrawal of armed groups from Aleppo’s international highway. During the military operations, also the armed groups’ hideouts were destroyed and tens of the terrorists were killed in al-Yarmoun, Bani Zeid, al-Manasher, Ramlah, Bab al-Hadid and Ghazi Askar districts and the mountains near Aleppo. A military source said on Saturday that the Syrian Army’s victories in several battles across the Northern province of Aleppo had caused the rebel groups to move to further areas to find new shelters. The terrorists of al-Nusra Front in the Southern parts of Nubul and al-Zahra towns were not able to resist against the army’s attacks, and fled the battlefronts. The situation in al-Ma’mel area between al-Joud and Byanon town in the Northern parts of Aleppo was the same and members of the al-Nusra Front evacuated from the fighting areas. The foreign terrorists who have come to Syria for a war of militancy are fleeing to neighboring Turkey after the Syrian army started massive operations to regain control over the city of Idlib in Northwestern parts of the country. “A large number of non-Syrian terrorists have fled to Turkey through Atmeh border crossing,” the Arabic-language Al-Watan newspaper reported. Meantime, military sources announced that the Syrian air force has increased airstrikes on the positions of Takfiri terrorists to pave the way for the ground operations in Idlib. On Friday, President Assad accused neighboring Turkey of torpedoing a UN plan for a ceasefire with rebels in the second city of Aleppo. Assad told the Swedish newspaper Expressen that Ankara had used its influence with rebel factions to persuade them to reject the proposals put forward by UN envoy Staffan de Mistura for a ceasefire in the former commercial hub. “The Turks told the factions — the terrorists that they support and they supervise — to refuse to cooperate with De Mistura,” the Syrian president said. The main western-backed rebel alliance is based in Turkey. Assad also accused Ankara of supporting jihadists with Al-Qaeda and the ISIL group since a peaceful uprising in 2011 escalated into armed conflict. Since 2011, Syria has been faced massive insurgency created by the certain Western countries and their regional allies that staged a propagandistic war against Damascus. The violence fuelled by Takfiri groups has so far claimed the lives of over 210,000 people, according to reports. New figures show that over 76,000 people, including thousands of children, lost their lives in Syria last year. At the beginning of crisis, certain western powers and their regional allies voiced loudly that Syrian protests have no diplomatic solution, and then they started supplying the country’s opposition groups with their arms and funds. But in 2014, specially after victory of President Bashar al-Assad in the country’s presidential election in summer, the army has gained upper hand in its anti-terrorism campaign, and has been partly successful in sealing borders with Turkey and Jordan. This entry was posted in Middle East and tagged Aleppo, Syrian Army, Terrorist, Turkey. Bookmark the permalink.